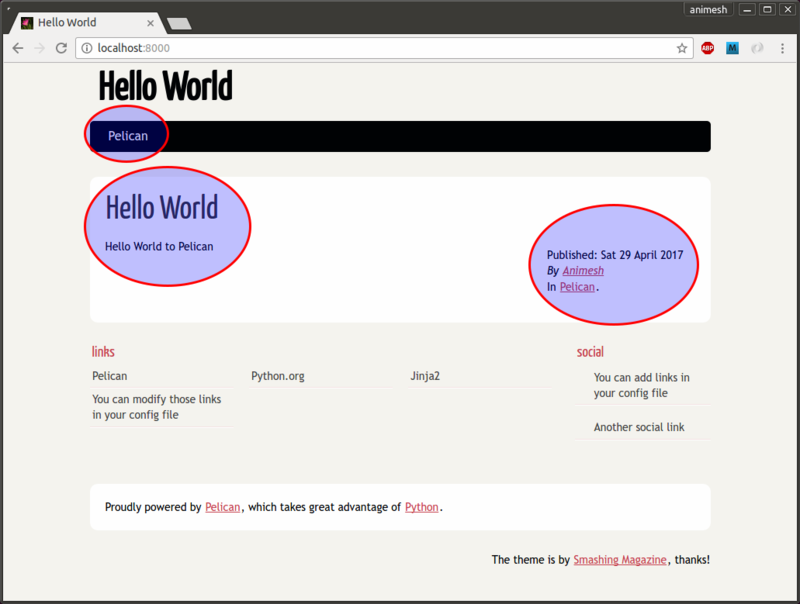 We have our boilerplate pelican blog available, now we have still not seen the magic of pelican. In this post we will see our blog coming to life. Now we will first execute some commands and see what happens with this boilerplate. Remember to be in the pelican1 environment. We can do this by. Once we are in pelican1 environment, we have all the pelican commands at our disposal. Kindly execute this command. The above command we are passing content as a parameter, which is nothing but one of the directory of the folder structure. WARNING: No valid files found in content. Done: Processed 0 articles, 0 drafts, 0 pages and 0 hidden pages in 0.12 seconds. theme #directory which contains some predefined images and css. Now let us see what the blog looks like. Just execute these commands. Nothing fancy here, but we will some content with some link and a default theme. It is petty good for being a boilerplate. Now we are ready for our first post, we will do the sample hello world which is the de-facto standard in programming languages first program. We will write the first post in Markdown. 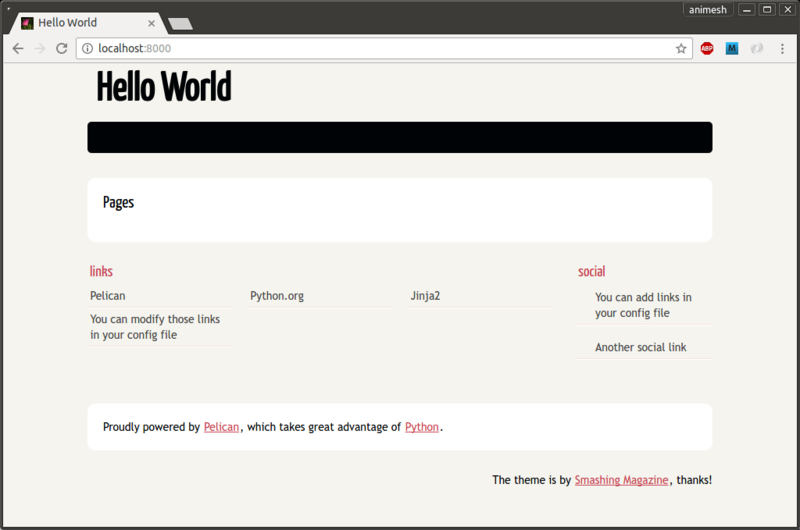 Create a file named HelloWorld.md in this directory content. Once create and saved this file, just run this command. This will have the following output. This time it clearly states that we have 1 article. Then follow the other commands as discussed. Again check the output on the browser at localhost:8000. Now this time the output is different and it look like this. The area surrounded in ellipse are new. This shows us the power of pelican, we do not have to bother how the content is presented on screen, we have to only concentrate on writing content.